Greenland ice melting four times faster than in 2003, study finds, Southwest part of the island could be major contributor to sea level rise, EurekAlert, 21 Jan 19, OHIO STATE UNIVERSITY COLUMBUS, Ohio – Greenland is melting faster than scientists previously thought–and will likely lead to faster sea level rise–thanks to the continued, accelerating warming of the Earth’s atmosphere, a new study has found. Scientists concerned about sea level rise have long focused on Greenland’s southeast and northwest regions, where large glaciers stream iceberg-sized chunks of ice into the Atlantic Ocean. Those chunks float away, eventually melting. 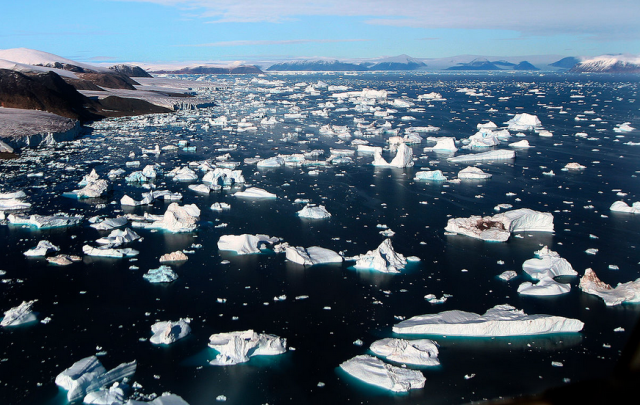 But a new study published Jan. 21 in the Proceedings of the National Academy of Sciences found that the largest sustained ice loss from early 2003 to mid-2013 came from Greenland’s southwest region, which is mostly devoid of large glaciers. YES – AN ASTONISHING, NAY STAGGERING EVEN, ZERO POINT 1 PERCENT OF ITS TOTAL MASS!!!!!!!! Are you effing kidding me? The uncertainty must be 10 times that much. Who measures this crap and thinks the numbers have substance??? Probably those barely 20 millennials with their participation PhDs.